Does your class have what it takes to find the murderer? A murder in quite house boat community sets the stage for you and your students to test their forensic knowledge. Students will take on the role of a forensic technician as they analyze hair, fiber, fingerprint, blood, and hand writing evidence to help pin point the killer. 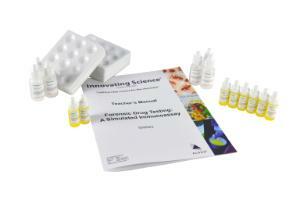 This kit provides a unique and complex set of evidence for students to analyze.